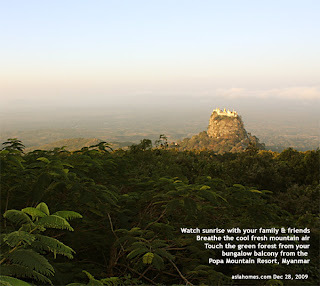 From Bagan Airport, my family reached Popa Mountain Resort in the evening. The mountain air was fresh. Dinner was at a restaurant before we reached the Resort. Our driver said that the food was less expensive and better at a hotel halfway up the mountain to the Resort. A waitress with a bald head served us. I asked my guide whether she was a nun. Do nuns work as waitresses in Myanmar? My guide asked her. She said, "No, I am not a nun. I was living in the nunnery for 7 days." I don't have the word for her action - getting enlightenment? Lots of fresh vegetables served during dinner to my delight. This area has fertile soil with ashes from Mt Popa some 250,000 years ago when Mt Popa was an active volcano. 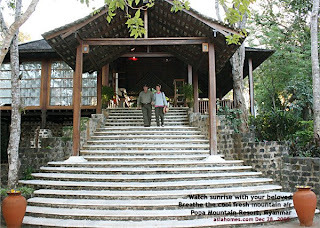 At Popa Mountain Resort, guests stay at the wooden bungalows with high ceilings. It luxurious accommodation, so much different from living in the average small hotel room in the city. Tall green trees, starry nights, tranquility. A big group of German and/or French tourists were already having breakfast. There were local families with their children at the breakfast balcony. Maybe around 100 people as this was a time of recession. The Popa Mountain Resort has several wooden bungalows with high ceilings built to merge with the slopes of the mountains. Spacious bedroom with balcony facing green forests. No mosquitoes. Fresh air. Tranquil nights. For romantic couples from fast-paced cities like Singapore, a 2-night stay will be great. Mt Popa, 1500 metres or 5000 sq ft is in the right of the picture. A most important worship centre of Myanmar. Thousands of pilgrims go to the Mahagiri Shrine which is on the top of Mt Popa to offer flowers and food to the 37 "nats" or spirits. 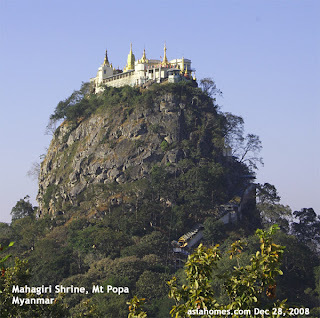 Hence Mt Popa is reported to be the "Mount Olympus" of Myanmar. Mount Olypmpus is where the Greek Gods live. I did not attempt to climb up the 777 steps to the top as I did not know whether my previously injured left foot would be able to take the stress. Monkeys are present along the way up to the Mahagiri Shrine of Mt Popa. I climbed up around 100 steps. Shops along the way. As my Canon camera has started to malfunction by not being able to focus after my visit to Lake Indawgyi. I did not manage to get any good focused pictures here and for the next 2 days of my travel in Myanmar. 1. Bring 2 cameras and 2 lenses. 2. Travel when you are young or interested in the cultures of other countries as there is a lot of walking to do. Only by walking can you appreciate the flora, fauna and culture of the country you visit. The climate was cool on this visit. Bright sunshine. Hundreds of pilgrims. Sitting inside the tour van going from one point to another will probably be what the average Singaporean will want, but much is missed in doing this. This trip probably suits Singaporeans and Caucasian expatriates who love to know about the cultures of other countries. 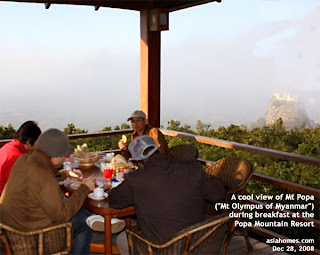 Asia USA Realty, a Singapore licensed travel agency organises visits to Mt Popa and Bagan or other places in Myanmar. I think you will directly find that the military owns the Popa Mountain Resort a) you shouldn't be there if you have any ethic fibre b) you shouldn't be promoting it.